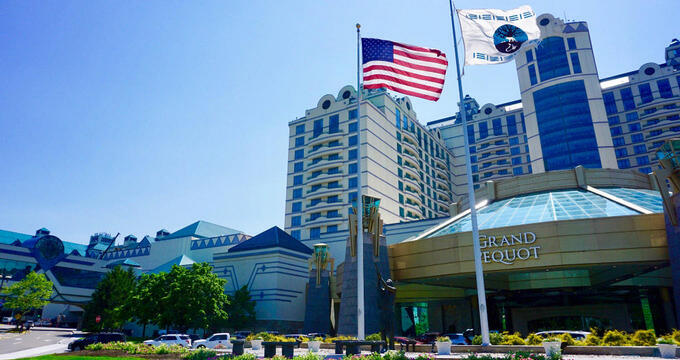 The Grand Pequot Tower is the height of luxury at the Foxwoods Resort Casino. Guests can choose from 23 floors of rooms and suites, including The Villas, a cluster of suites with over 1,000-square feet of space and 24-hour butler service. The Vue 24 restaurant overlooks the resort from the hotel’s top floor for dinner or drinks with a view. The Norwich Spa at Foxwoods pampers guests with massage, facial and body treatments, and an array of spa facilities, including a fitness center and salon. Hours of gaming entertainment at The Grand Pequot Casino and world-class shopping await on the main floor. The 450-square foot deluxe rooms at Grand Pequot Tower offer either one king-sized bed or two queen-sized beds. The rooms also feature a coffee maker, refrigerator, breakfast table, and writing desk, with a vanity and marble bathtub and shower in the bathroom. The king-sized Petite Suite features a half bathroom in addition to the full bathroom with a Jacuzzi tub. The Corner Suite offers 1,400 square feet of living space, with separate bedroom and living room, master bathroom and dining area. Also located within Grand Pequot Tower, The Villas are 23 luxury suites averaging 1,400 square feet, each with a large flat screen TV, living room, Jacuzzi tub, and 24-hour butler service. A day at Grand Pequot Tower begins with breakfast in the Veranda Café overlooking the expansive New England forest surrounding the resort. Caputo Trattoria serves both classic Italian and Northern American cuisine, with antipasti, house-made pasta, and desserts. David Burke Prime ages some of the world’s finest steaks right in its on-site salt-brick aging room. The steakhouse also serves seafood, chops, and fine wines, with a special breakfast buffet. With classic Continental cuisine, cocktails, and panoramic views from the 24th floor of the hotel, Vue 42 offers an elegant yet modern dining experience. Guy Fieri’s Foxwoods Kitchen & Bar is a 258-seat restaurant serving bold American creations from the award-winning celebrity chef Guy Fieri. For a change of pace, Golden Dragon serves a wide range of Chinese dishes. Guests can also order from the hotel’s in-room dining menu from morning to night. Visitors to The Norwich Spa at Foxwoods can enjoy a massage or body treatment in one of 12 private rooms. The Spa has a fitness center with cardio and strength-training equipment, as well as separate men’s and women’s locker rooms, each with their steam room, sauna, whirlpool, and lounge area. The salon at The Norwich Spa also provides a range of nail and hair services. Foxwoods Resort Casino is home to Lake of Isles, an 18-hole championship golf course with over 900 acres of fairways, greens, and wooded hills. Golf Magazine lists the course among 2017’s “Top 100 Courses You Can Play.” Lake of Isles also offers a 50,000-square foot clubhouse and 300-seat banquet hall perfect for a business meeting, wedding, or other celebration. The Matches Tavern serves breakfast, lunch, and dinner, with a deck overlooking the property’s scenic 90-acre lake. For a better game, guests can register for private or group lessons at the Troon Golf Academy, with state-of-the-art technology and professional instructors. High Rollers Luxury Lanes & Sports Lounge offers all the fun of a bowling alley with delicious pizza, appetizers, and drinks. Grand Pequot Casino features slot machines and table games like Baccarat, Blackjack, Craps, Poker, and Roulette. While at the Casino, guests can grab a drink and play bar-top games in the Spin Bar. The Casino also leads into the Tanger Outlets at Foxwoods, an expansive collection of brands like Calvin Klein, Nike, Brooks Brothers and more. The hotel itself offers plenty of shopping options as well, with brands like Bvlgari, PANDORA and Chopard for jewelry, handbags, sunglasses, and other accessories. Essentials are open 24 hours for everything from beverages and snacks to books and Native American gifts. The Foxwoods Watch Co. offers timepieces from Rolex, TAG Heuer, and other top brands. A hike along the Pequot Trails is a great way to take a break from all the action and explore the wooded Mashantucket hills. Along the route lies the Mashantucket Pequot Museum & Research Center, with temporary and permanent natural and cultural history exhibits. The museum also features a 320-seat auditorium showing educational films and videos, a restaurant, classrooms, and museum shop. Visitors will learn the history of the Mashantucket Pequot Tribal Nation, with access to archival and art collections in The Research Center.